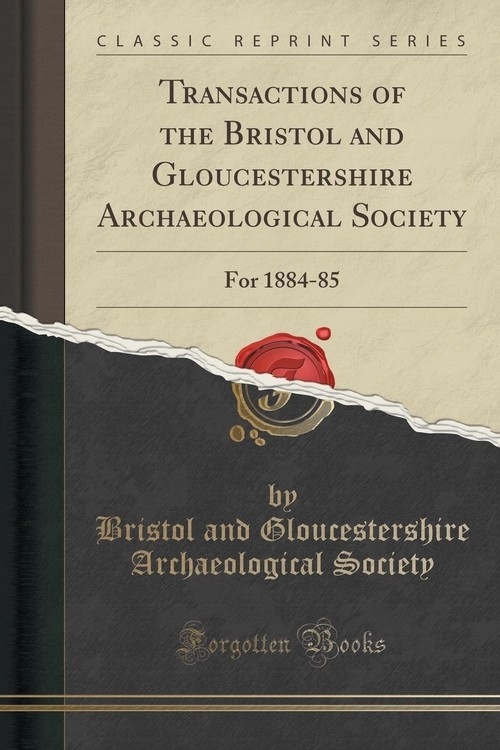 Excerpt from Transactions of the Bristol and Gloucestershire Archaeological Society: For 1884-85<br><br>History of Taxation & Taxes in England. By Stephen Dowell, Assistant Solicitor of the Inland Revenue ...198-201; The Algonquin Legends of New England. By Charles G. Leland ...201-204; The Nation in the Parish. By Emily M. Lawson, with a Glossary of Local Words and Phrases. By Rev. Robert Lawson, M.A. ...204-206; A Short History of the Episcopal Church in the United States. By the Rev. W. Benham, B.D., F.S.A. ...206-207; The Gentleman&apos;s Magazine Library. Edited by George Lawrence Gomme, F.S.A. ...207-208; The Lord of the Marches and the Lord Mayor. By Emily Sarah Holt ...208-210; The History of Launceston & Dunheved. By Richard Peter, Town Clerk of Launceston, and his son, Otho Bathurst Peter ...210-213; The Marriage, Batismal and Burial Registers, 1571 to 1874, and Monumental Inscriptions of the Dutch Reformed Church, Austin Friars, London, & c. Edited by William John Moens. (Privately printed)...213-214; Days Afoot and European Sketches; and Round about Haida. By James Baker ...214-215; An Account of some of the Incised and Sepulchral Slabs of North-west Somersetshire. By E. W. Paul ...215-216; Ecclesiological Notes on some of the Islands of Scotland. By T. S. Muir ...216-223; De Nova Villa; or, the House of Nevill. By Henry Swallow ...223-226; The Pipe Roll Society&apos;s Publications ...358-359; Bibliotheca Dorseticusis. By Charles Herbert Mayo, M.A. ...359-360; Church Plate in the Archdeaconry of Worcester. By William Lea, M.A., Archdeacon of Worcester ...361-362; Notes and Queries ...362-364; Announcements - Ancient Stronghold of Worlebury ...364<br><br>About the Publisher<br><br>Forgotten Books publishes hundreds of thousands of rare and classic books. Find more at www.forgottenbooks.com<br><br>This book is a reproduction of an important historical work. Forgotten Books uses state-of-the-art technology to digitally reconstruct the work, preserving the original format whilst repairing imperfections present in the aged copy. In rare cases, an imperfection in the original, such as a blemish or missing page, may be replicated in our edition. We do, however, repair the vast majority of imperfections successfully; any imperfections that remain are intentionally left to preserve the state of such historical works.